We got a quick look at this on the way through about a week ago - this is West Gate, which I've written about several times. As you can see from these pictures in particular, West Gate is not showing it's usual profile: the windmill is missing. No wait, that's it lying on the ground behind the water tank. 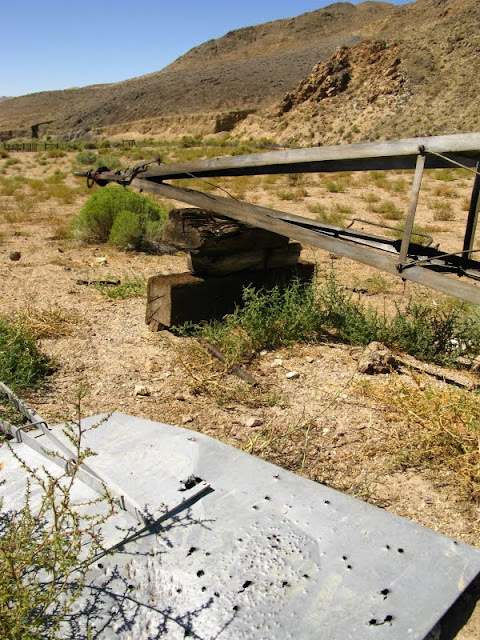 We were concerned that the windmill had fallen over, been knocked down, or was in the process of being replaced by one of those solar-powered pump jacks I've seen being used instead of older windmills in some parts of Nevada. We didn't have time to stop and investigate. 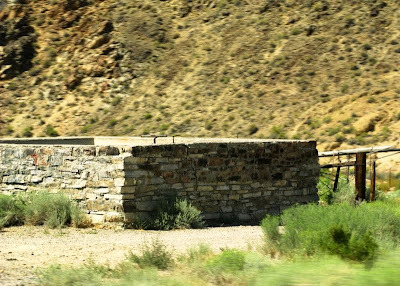 On the way back, the windmill was still down, hidden behind the square water tank. It was on the ground, let loose from it's moorings and guy wires. The top of the windmill tower was blocked up by railroad ties, and one slightly shot-up vane was lying on the ground. We didn't see any of the other vanes. ...with a few parts lying around. I can't pretend to know the names of many of the parts. Is the top called the head? Not sure. 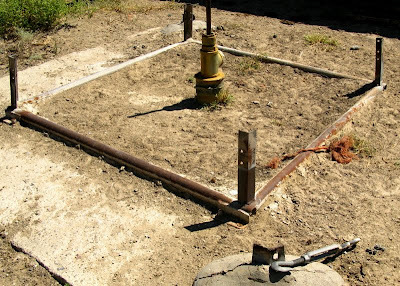 Here's the concrete platform with part of the pump or the pump casing in the center, and tower attachment points outward from the center. 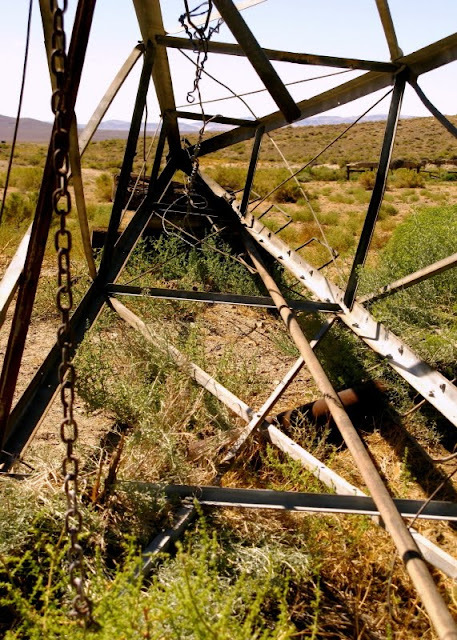 An unusual view of the windmill, with the sucker rod lying loose in the middle of the downed tower. 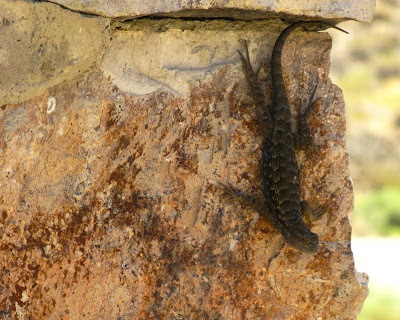 Our friends, the blue belly lizards, were still hanging around, although this time we only saw this one. 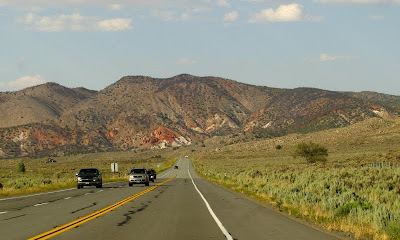 We drove across Nevada last week, and then drove back again - not all in one day, but on two days about one week apart. 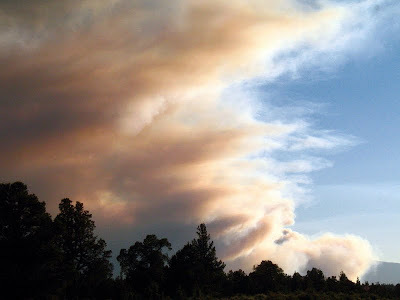 We saw signs of fire on both the westward and eastward legs of our journey. 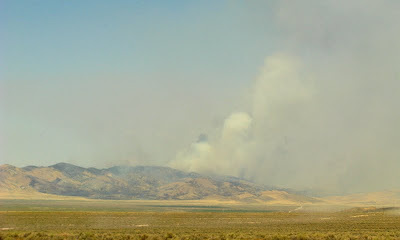 The first sign of fire, besides an overall haziness, was smoke north of Highway 50 between Mt. Airy Summit and New Pass Summit, west of Austin and northeast of Cold Springs. Rays of sunlight shone through hovering cumulus clouds, adding a little drama to the view. The smoke was from this fire, which finally came into our view as we drove into Edwards Creek Valley. The burning hills are in the northern end of the Clan Alpine Mountains, a part of the mountains consisting of a low range of hills straddling the Clan Alpine Mountains proper to the west and the New Pass Range just east (right) of the photo. ...a week later - yesterday - it looked like this. On that same first day, we got a passing look at the remains of the Trailer 1 and Red Rock Fires. 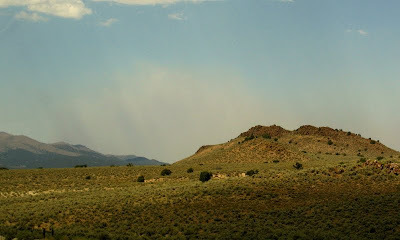 The Red Rock Fire, above, burned along a granitic ridge north of the first Red Rock exit on 395 north out of Reno in Nevada and California. This ridge, Petersen Mountain, has burned two or three times in my memory - the first time being in either the mid or late 1970's. The area introduced me to cheat grass, which grows amidst crested wheatgrass that was planted in the area as early as the late 1970's. Farther to the north, at the second Red Rock exit on 395 in California, the Trailer 1 Fire is marked by a spray of red fire retardant on the right side of the photo and by blackened trees above the red and white rocks. 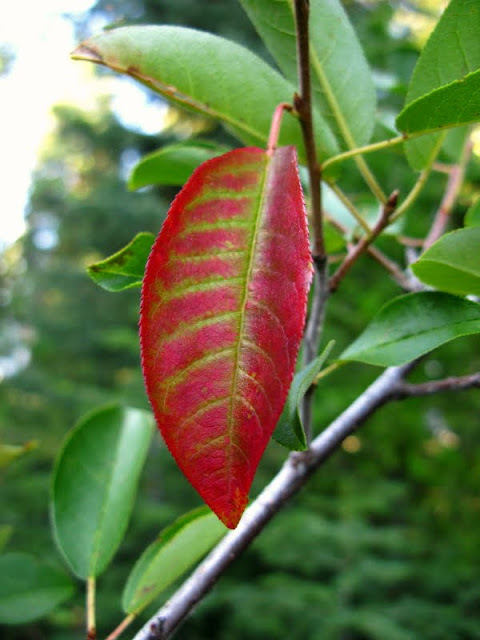 The fire retardant is the same color as the reddish-brown Tertiary ash-flow tuff: the red rocks that give the looping Red Rock Road its name. 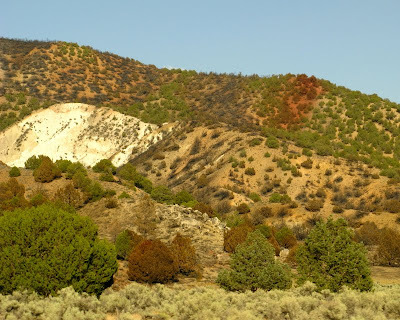 A closer view of the southern part of the Trailer 1 Fire, with red fire retardant, white tuff, and blackened trees and bushes. 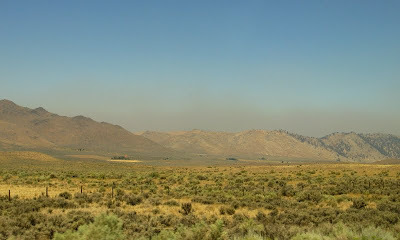 On our way back through Reno yesterday, there was a lot of smoke around, including some that had piled up in Sierra Valley north of town, just west of Beckwourth Pass. This smoke might be from a fire in the immediate area - which is what it looked like in passing - or possibly it is smoke blown north from the Big Meadow Fire in the Yosemite area. 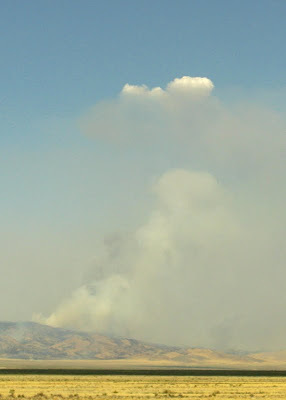 The smoke in Reno - seen in this photo that looks south - is supposed to be from the Big Meadow Fire near Yosemite. 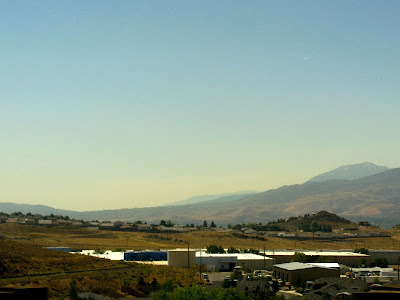 Most of the Sierra Nevada wasn't visible through the smoke - in Reno we could see Mt. Rose, Slide Mountain, and part of the Carson Range to the south, but we couldn't see the mountains down near Markleeville. 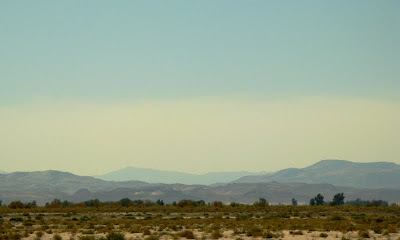 We could see this same thick blanket of smoke from Highway 50 east of Fallon looking west back toward Reno, and although we couldn't see the Virginia or Carson Ranges, we could see the 9,005-foot-high peak of Mt. Como in the Pine Nut Mountains in the distance. I hope these things stop burning soon. Thanks to @NevadaWolf for telling me a bit about these fires and for pointing me towards some fire-incident links. 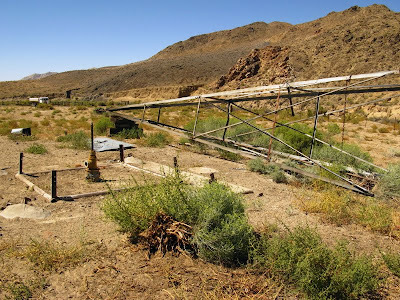 While out and about on that recent trip I mentioned in an earlier post, I hunted and searched for the site of a long-ago helicopter camp in the Rainbow Canyon part of Meadow Valley Wash south of Caliente, Nevada. The hunting and searching was conducted through the window of a Prius, while the Prius driver dodged small and large holes in the road, skirted undercut edges of pavement where the river had nearly wiped out the road in the 2005 flood, and made seemingly endless passages back and forth from pavement to dirt and dirt to pavement, especially in narrow parts of the road that are now essentially one laned. Pavement fragments from the originally two-laned road now in flood deposits on the side of the road. 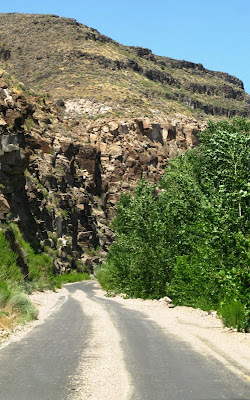 A narrow part of the road in the gorge or narrows part of the canyon north of Elgin. Lower steep cliffs are in strongly welded ash-flow tuff. 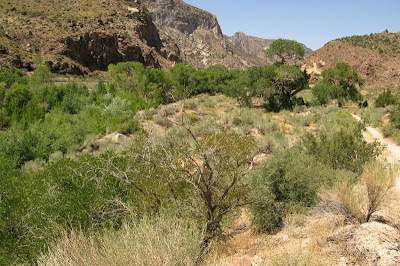 Caliente camp, looking north up Rainbow Canyon. 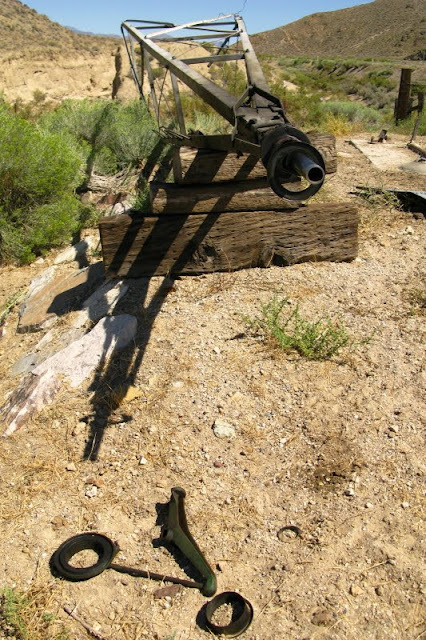 Caliente camp - which I think I found, see this MSRMaps map location - was the site of our first base of operation in the summer of 1978. 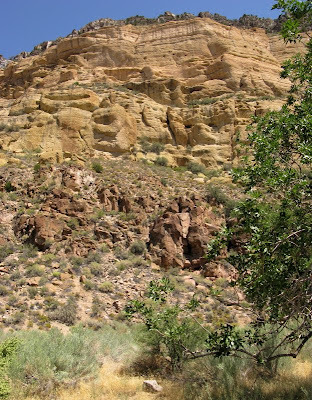 That first year - the first year of two years of helicopter-supported uranium recon - we had two camp groups of four summer geologists each, and the group I was in camped in four locations: Caliente, Deer Lodge, Hot Creek, and Bowman Creek. The camps were helicopter camps in the sense that we used helicopters for airborne radiometric surveys and to get to our remote field locations. All camps were accessible by 4-wheel-drive. 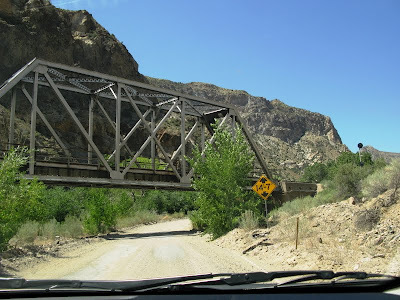 Two of our camps, Hot Creek and Bowman Creek, were along or below creeks with usable running water; two, Caliente and Deer Lodge, were not, and for those we hauled water in large tanks that fit in the back of our half-ton and 3/4-ton pickup trucks. I'd call the usable water "potable," but that implies that it was good enough for drinking without any treatment, and almost all our water was treated with the addition of chlorine bleach. Our main jobs, as young and budding geologists, were collecting stream sediment samples, taking scintillometer readings, making sketch maps of the drainages we traversed, and mapping occasional areas of interest, over which we had staked claims. Our more detailed maps, still considered recon maps, were at a scale of 1:24,000. The view from my tent door looked something like this - provided that I really found the right location after 30-plus years of floods. Camp sat at the base of a 1000-foot-high cliff on an alluvial ledge perched over the flowing water of Meadow Valley Wash. Our camp equipment - tents, trucks, trailers, shower, and outhouse - were scattered amongst the cottonwood trees, facing toward the cliff and away from the paved road, the train tracks, the creek, and the opposite cliff wall, all of which were crammed into that narrow gorge. We were hidden from casual view by cottonwood and willow thickets. I placed my tent as far away as I could from the center of camp, a center marked by a 55-gallon drum-turned-into-wood-stove, which we used for heat on chilly early mornings before the helicopter took us to the heads of various drainages. Camp was arranged in one long line, from the shower at the north end to my tent at the south. In between were L's trailer, the mess tent, a propane refrigerator, the heating drum, G’s trailer, the cook's tent, L’s tent, G’s tent, two tents for three other early-starting summer geologists, a tent for the helicopter pilot and fuel man, the helicopter, fuel truck, and our brand new 1978 Ford 4-wheel-drive pickups. 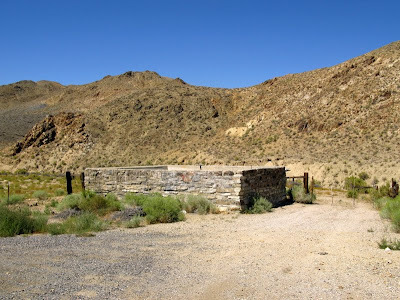 The outhouse - not in the same line as the main part of camp - was up the hill a ways, amid the privacy of sagebrush and purple sage, it's open door facing toward the nearby cliff. L and G were our two bosses, the head boss and a sub-boss of the Western District of Northern Exploration Company, NEC, a U.S. branch of a major Canadian mining company (not the real company name). L's trailer was the larger of two field trailers that we used that summer, one trailer for each of our two recon camps. At Caliente camp, we used L's trailer for cooking, storage of supplies and maps, and as a small field office. Each afternoon before dinner, we plotted sample locations, lines from our helicopter-borne radiometric surveys, and any mapping we had completed on clean, unfolded 7.5-minute topographic maps. G's trailer, the smaller of our two trailers, would be used the same way when we later split our gradually growing group into two camps. The main road, paved and graveled, ducks under the railroad tracks where it leaves the camp area and heads north toward Caliente. Continued at Caliente Camp: Some more Exploration and Caliente Camp Continued: Part 3, Part 4, Part 5, and others. It's an early morning at the lake, and although it is relatively cool this morning - 41° and 53° F at two nearby towns and 59° F inside the house - this is a good time to wander around the yard looking for birds, deer, and other nature in general. I am, however, not outside wandering around the house but, instead, am inside having coffee. The coffee is a requirement. And so, what can one see if one braves the chill with coffee cup in hand? 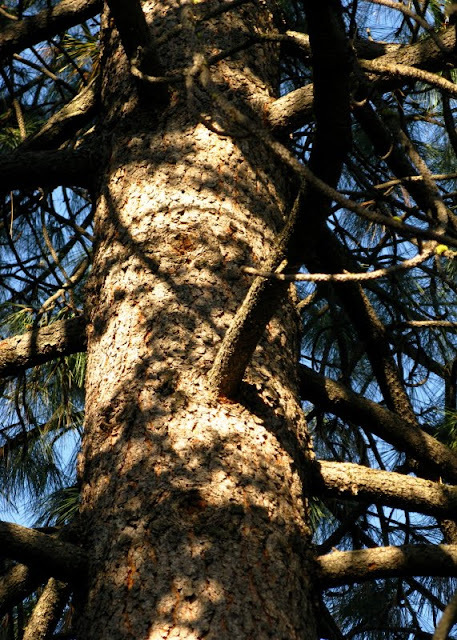 Trees, like this ponderosa pine, tower overhead as I walk through the front yard. 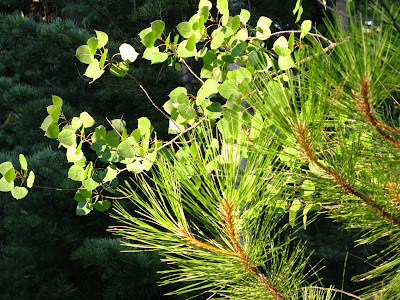 Aspen leaves and pine needles glow in the early morning sun. Berries of some kind, at least those few that the birds haven't gotten, hang from branches of a currently unknown bushy tree (or tree-y bush?) 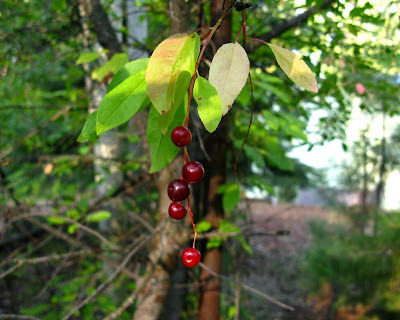 in the overgrowth and brambles that comprise a good portion of our backyard. Looking carefully while wandering around, one can find a few hints of fall, although the aspens aren't even thinking about turning color yet - that's really for later. 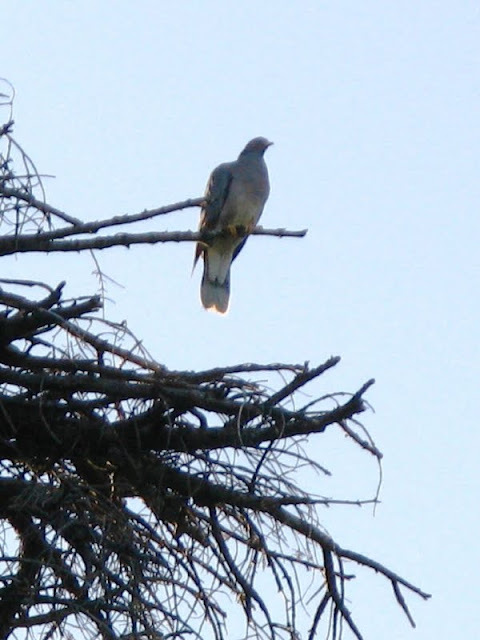 And high up in a nearby snag, this band-tailed pigeon was hanging around, cooing, it's back warmed by the early morning sun. My blogging recently has been a little less than sporadic, after a good start to the month. I've been distracted by some personal things, by life in general. A retreat at the lake sometimes leads to renewal, although I've been bird-watching more than blogging. And today, I'm off to The Big City, for shopping and more coffee. I was thinking of cutting my hair, but maybe that wouldn't be a good idea. Seen first at Dinochick Blogs and Outside the Interzone. We - MOH and I - recently returned from a trip that took us to points south. It was kind of a quick trip, but we did manage to drive by the first area I ever mapped professionally, back in the uranium exploration days of the late 1970's. This first map area is in Meadow Valley Wash, about 19 km (12 miles) south of Caliente, Nevada, just north of the Boyd railroad siding (general location map). Meadow Valley Wash is a river most of its 177 km or 110 miles (length according to Wikipedia), especially south from Panaca. I saw intermittent stream symbols on the map only intermittently (ha!) in the area northeast of Panaca. 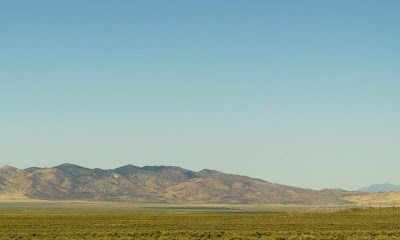 It's headwaters are in the White Rock Mountains and Wilson Creek Range on the Nevada-Utah border northeast of Panaca. From Panaca it then flows mostly southward towards the Colorado River, via the Muddy River, which it enters near Moapa, Nevada. The Muddy River flows into northern Lake Mead. Meadow Valley Wash is prone to flooding. One recent big flood was in 2005. The shapes of things have changed since the last time I was in the area 31 years ago. 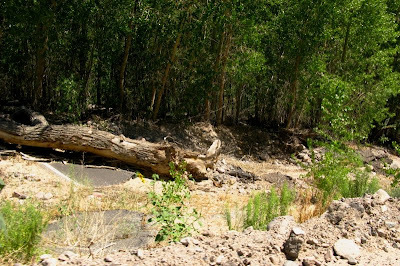 The river channel has moved around some in the Rainbow Canyon area between Caliente and Elgin; some old roads or river crossings appear to be gone. And now I've gotten away from the main point of this post, which was my first professional mapping experience. 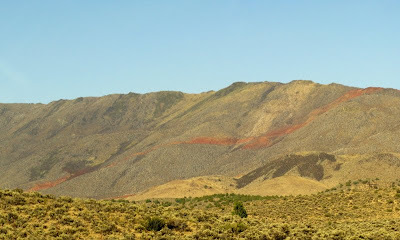 We were in the area to look for uranium in the Tertiary volcanic rocks in the area of the Caliente caldera complex, and also in and near the younger Kane Springs Wash caldera to the south and southwest. 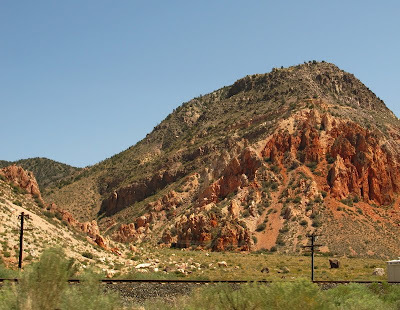 The altered and strongly hematite-goethite±jarosite-stained zone - that mass of light orange to red-orange to red-brown rocks in the photo above - is part of a rhyolite flow, dome, and dike complex probably associated with the formation of the Caliente caldera. The altered rhyolitic rocks - which overlie altered older andesite flows and flow breccias, and underlie mostly unaltered younger ash-flow tuff units in the map area - gave a strong radiometric anomaly, which ultimately proved to be due to high thorium (and at least normally high potassium) rather than from high uranium. We thoroughly mapped and sampled the area of interest and took a lot of ground scintillometer readings. Our scintillometers read in α (alpha), β (beta), γ (gamma), and Total Counts, and looked something like the scintillometer in this picture. Continued at Our Camp in Meadow Valley Wash.
Harding, A.E., Scott, R.B., Mehnert, H.H., and Snee, L.W., 1995, Evidence of the Kane Springs Wash Caldera in the Meadow Valley Mountains, Southeastern Nevada: in Scott, R.B. and Swadley, WC, eds., Geologic Studies in the Basin and Range - Colorado Plateau transition in southeastern Nevada, southwestern Utah, and northwestern Arizona, 1992, U.S. Geological Survey Bulletin, 2056-E, p. 131-179. Page, W.R., Dixon, G.L., Rowley, P.D., and Brickey, D.W., 2005, Geologic map of parts of the Colorado, White River, and Death Valley groundwater flow systems, Nevada, Utah, and Arizona: NBMG Map 150, map and text. Rowley, P.D., Nealey, L.D., Unruh, D.M., Snee, L.W., Mehnert, H.H., Anderson, R.E., and Gromme, C.S., 1995, Stratigraphy of Miocene ash-flow tuffs in and near the Caliente caldera complex, southeastern Nevada and southwestern Utah: in Scott, R.B. and Swadley, WC, eds., Geologic Studies in the Basin and Range - Colorado Plateau transition in southeastern Nevada, southwestern Utah, and northwestern Arizona, 1992, U.S. Geological Survey Bulletin, 2056-B, p. 43-88. 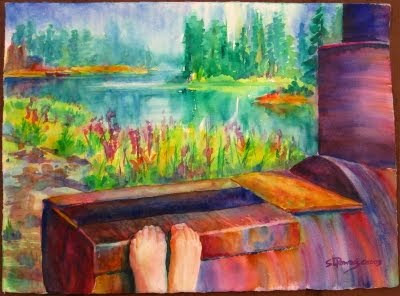 A Summer on the River is another Alaska-inspired painting, one based on the view from my parents' cabin on the Kenai Penninsula. I'm actually not that great at coming up with titles for my paintings, and don't remember what the original title was right now. I probably have notecards of this painting with a different title. Maybe it was "Put Your Feet Up," or maybe that was a suggestion that I didn't use. made of left over pieces of oil pipe used at the several fields on the Kenai Peninsula. 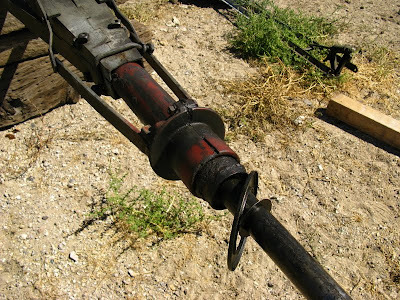 The guy who made it, Cotton Moore, was a pipe welder who managed to save pieces of pipeline, mostly odds and ends.... He saw a market... and made outdoor stoves for many years after the main pipeline construction was finished. [Our stove] was made shortly before his stockpile ran out. This description is from the source, the owner of said wood stove. It was summertime, 1997, and I spent a good portion of that summer at the family cabin on the Kenai River. It was a particularly warm and unusually sunny summer. We took advantage of the weather, and did a little fishing, which we would have done even if the weather had been more typically cool and cloudy to rainy. 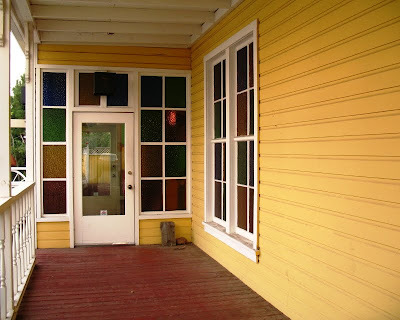 In between times, we ate lunches and dinners out in the Alaskan-style covered picnic shelter, and we enjoyed evening fires in the custom-made wood stove. Copyright © 2009 Looking for Detachment. I haven't been doing that much hiking recently, not since our second Wheeler Peak hike, which was one week after the Wheeler hike I reported on last month. The second hike on Wheeler was less spectacular, except for the increase in blooming wildflowers; oh, and it was sunny. We didn't go as high, I couldn't go as fast, and it became apparent that I had inflamed or overused my right IT Band, resulting in something commonly called "runners knee." I've been going easy on any walks or hikes on hills ever since, with the downs being worse than the ups. Last week, I broke from the taking-it-easy mode, and went farther up our hiking hill than I have been going recently, resulting in another flare-up, though one not as bad as the first. Overall, that aspect of hiking has been discouraging. What I need are hills where I can walk down first, then walk back up. 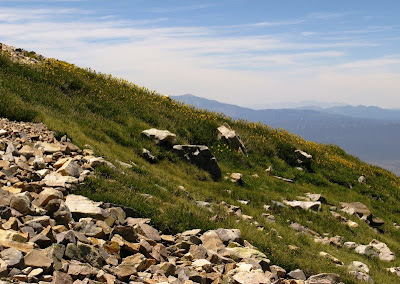 This can be done at Great Basin National Park, not by heading for the peak, but by walking down from the Wheeler Peak Camp toward the Upper Lehman Camp, then turning around and walking up before the leg and knee get sore. That's the reverse of the kind of hiking I prefer to do. On the way back down, not far above our little house, MOH and I came across a group of birds hanging out in and near this stack of railroad ties. 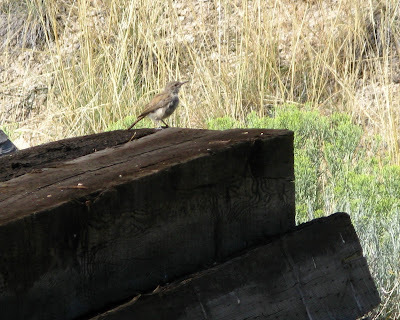 The railroad ties had obviously been stacked up for the birds' convenience and entertainment. The birds turned out to be Rock Wrens. More pictures of these birds and interesting descriptions of them and their habits can be found here, here, and here. Most of the Rock Wrens we saw were fluffy, as though they were newly fledged. This one appeared to be begging for food. This is the same bird with it's mouth closed. 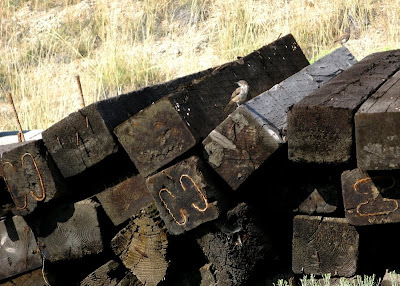 A Rock Wren blends in with a nearby pile of old cottonwood stumps. I managed to catch two of these birds engaged in a curious activity. These birds pop up and down, up and down, as you can see in these three photos. Up and down, up and down... doing something The Sibley Guide to Birds refers to as "deep knee bends." MOH and I have both seen Rock Wrens in and near our little garden, although I have not yet managed to get a photo of them there. 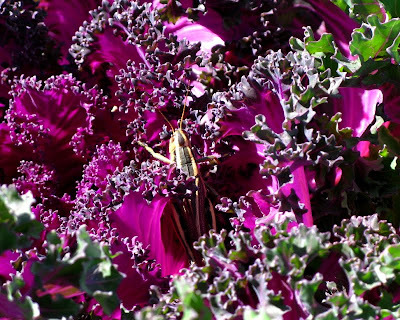 We are hoping they are eating nasty bugs and insects, such as the large grasshoppers we have seen recently. 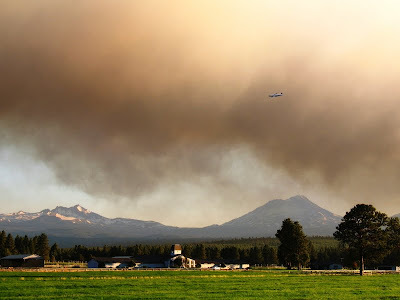 The Sisters area was covered by smoke from the Black Crater Fire,* which started not long before I drove into Oregon for a family reunion in late July, 2006. Consequently, the view looked like this when my parents and I drove west toward Sisters on Highway 126 (MSRMaps map). 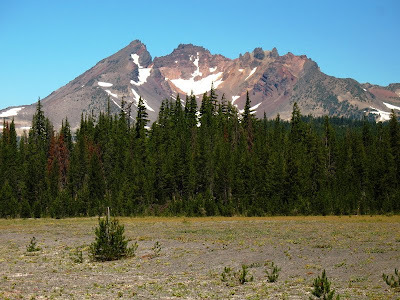 We didn't know how close we could get, and we finally came to this field on the McKenzie Pass Highway just west of Sisters, barely out of town, which is one of the best viewing areas to see the Three Sisters. 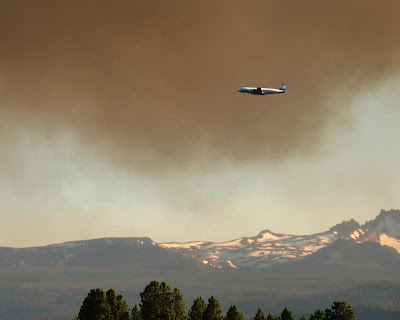 ...so we took a lot of photos of them flying around, including the two above with Broken Top, or part of it, in the background. The next day - although the fire hadn't been put out and Sisters was under threat of evacuation (and was eventually partially evacuated) - the view of Broken Top (MSRMaps map) from the Cascade Lakes Highway** was amazingly clear, despite the haze and smoke almost everywhere else, including at our reunion site north of Redmond. 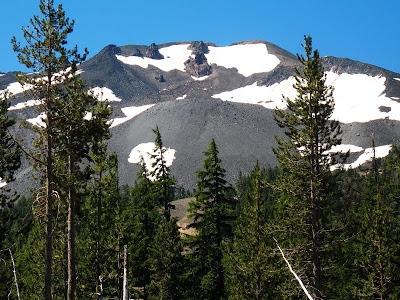 The Cascade Lakes Highway has some great views of the volcanic landforms of the region; the road goes just north of Mt. Bachelor, seen above looking up into a cinder cone on its north side. We made it to this turnoff (I think to Mt. Bachelor ski area), where the road to the left was signed no-entry because of a fire camp. 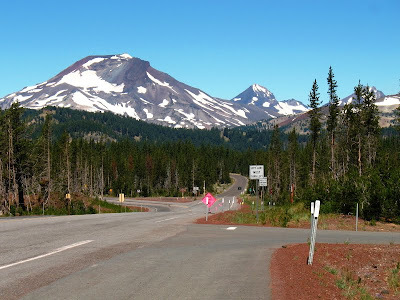 This is a great area to stop and see the South Sister, and the Dutchman Flat viewing area for Broken Top is either shortly before or shortly after this road junction. Later, if you are of a mind to and still happen to be in the area, you can have dinner in Tumalo. 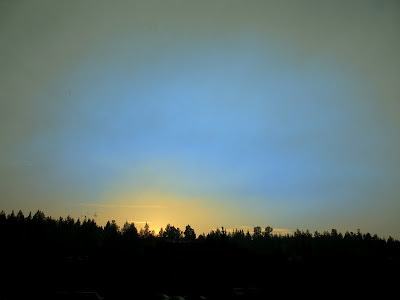 If you are a photophile, you can play with the settings on your camera and take weirdly colored sunset pictures. 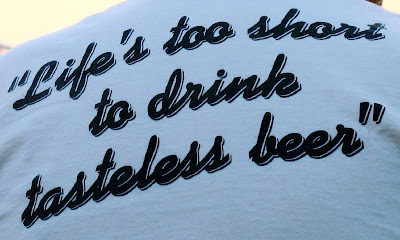 And if you are supremely lucky, you can marvel at the apt sentiments found on a typical geologist's T-shirt. 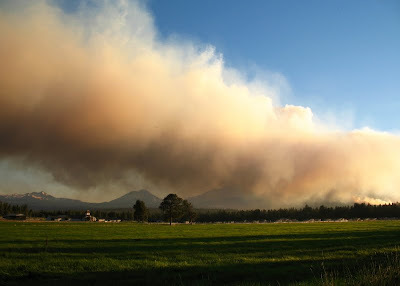 * The Black Crater Fire continued into August, long after we had left the area, and resulted in some evacuations. For those who are interested, more pictures of the fire can be seen here and here, and more information can be found on the web. 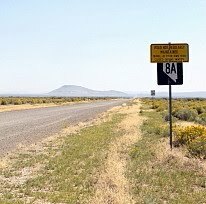 ** The Cascade Lakes Highway leaves southwest Bend as SW Century Drive or Century Drive Highway according to Google Earth and the Oregon Atlas & Gazeteer. Carnival of the Arid #6 is Up!